Operating without a defined strategy is bound to limit your digital marketing efforts. A digital strategy should adhere to the principles Integrated Marketing Communication (IMC), whereby all channels align with the same objectives and messages. Digital has an obvious advantage over traditional marketing: data. But if you don’t know how to interpret, analyse and pull insights from your data – and few know how to do this well – you’re not tapping into your digital strategy’s full potential. As a leading digital and Brisbane SEO company with dedicated specialists in all channels, Search Factory breaks down the digital strategy. A digital marketing strategy is a plan encompassing a range of channels to increase sales, awareness, growth and engagement for a product, service or brand. Digital strategies should be timely, reasonable and measurable. Macro-strategy that provides direction for all micro-strategies, facilitates cross-channel integration, measures the performance of each strategy and ensures that all initiatives are in line with objectives and brand messaging. Search engine optimisation (SEO) primarily involves keyword research and the analysis of technical onsite and offsite optimisation issues. SEO is a long-term investment as it can take time to build authority. The main objective of SEO is to position a brand’s ranking high in organic search results. Unlike AdWords, clicks generated by SEO come free of charge. However, SEO requires ongoing investment and a consistent stream of links to maintain and improve organic rankings, traffic and conversions. It’s no secret that to capture search traffic, you need to appear on the first page of Google. The below graphic designed by yodaLONDON with stats by HubSpot demonstrates why ranking on the number one page is so essential. Search engine marketing (SEM), commonly referred to as pay per click (PPC) advertising, is favoured for targeting highly competitive keywords to drive conversions. It differs from SEO in that it provides instantaneous exposure and focuses on keywords that represent purchase intent (e.g. buy prefix or location suffix). When it comes to Google AdWords Management, remarketing is one of the most effective strategies in the Paid Media toolbox, as it allows advertisers to segment users and serve them ad copy or display ads based on their level of engagement with the advertiser’s website. This can be used to drive conversions for low-involvement purchases like clothing, or provide further information for high-involvement purchases like professional services. As you can see from the below stats, remarketing can be incredibly effective in attracting clicks and conversions from returning users. As search engines continue to use links as the top indicator for a website’s authority, link building remains an important part of digital strategy. However, guidelines around link building have become increasingly stringent, with quality exceeding quantity. Google’s Penguin 3.0 algorithm update saw websites with over-optimised anchor text and poor quality links take a significant hit in rankings. Instead of rewarding dodgy link building tactics, Google now focuses on relevance and deep-linking (links that point to a page about the same topic). If you’re not sure what’s involved with a deep-linking strategy, we’ll use a webpage about travelling to Vietnam from Australia as an example. Ideally this page should contain links from pages with high authority, such as an Australian travel blog site that discusses travelling to Vietnam or Asia. The brutality of Google’s Penguin update proved to be an impetus for the content marketing movement, with a renewed focus on rich, engaging and shareable content. This covers all content that appears on your website, including text, images, videos, PDFs and eBooks. The issue with a lot of content is that it hasn’t been crafted with an audience in mind, or lacks a distribution strategy. Paid media distribution and syndication can benefit from content marketing by targeting specific demographics. Showing content like infographics, video, interactive quizzes and competitions (owned media) to the right audiences can lead to improved engagement, social sharing and earned media link acquisition. Social media marketing is all about engagement – but it’s not as simple as adding a post every few weeks or consistently pushing your latest sales promotions. A focused social media strategy segments users and creates personas. Based on these insights, timing and content can be tested to pinpoint the best way to engage with audiences across different channels. Even if you have an e-commerce site primarily focused on sales, just posting promotions on Facebook all the time may lead to low social media engagement. The key is to balance promotions with engaging content. For example, a website that sells wellness products might mix it up by placing motivational quotes on their page throughout the day and running limited-time promotions at night or during lunch periods to entice users to purchase. And Facebook isn’t the be-all and end-all social platform; the below stats show how big brands get far better engagement out of Instagram compared to Twitter. eDM (Electronic Direct Marketing) and database marketing are extremely targeted, in-depth approaches to online marketing. The two work in unison, with a company either building or purchasing a database that aligns with their target audience and delivering email marketing campaigns to those users. The best kind of eDM strategy uses advanced user profiling and intelligence from e-commerce purchases to produce custom offers. For example, instead of your regular email sign-up, a website could encourage users to create an account via Facebook. This would grant the site access to their Facebook details. Using the Facebook API, the site could gather information on the user and group them into a database based on whether they interact with friends overseas. A custom eDM could then be sent to all users in the database offering free shipping to up to 3 friends in different countries if they spend $150 or more. Database marketing is especially important in the age of smartphone technology. Research from Litmus summarised in the chart below shows the rise of mobile email marketing to the point that nearly half of emails are opened on smartphones and tablets—a 500% increase in four years! It goes without saying that eDMs should be mobile centric. The adoption of smartphone and tablet technologies has radically changed the behaviour of internet users. 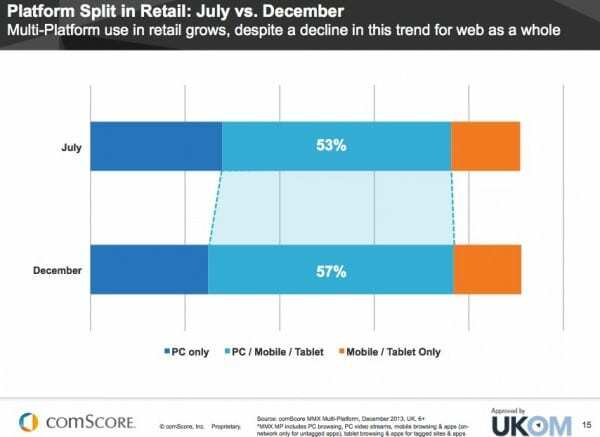 The below graph from comScore shows an increase in multi-device usage from 53% to 57% from July to December 2013, and a subsequent decrease in desktop-only usage. 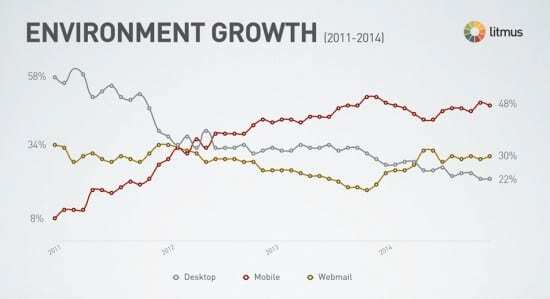 This emphasises the importance of cross-platform digital strategies. A mobile engagement strategy can be as basic as ensuring your responsive website provides a good mobile user experience, or as advanced as using AdWords remarketing (this targets mobile users who have visited the desktop version of your website by using different ad copy to increase conversions). The application of mobile engagement will depend on the target audience and product/service, but mobile-centric strategies are no longer a thing of the future; they are an essential part of the present. Too many websites nowadays focus on what the client thinks is a good design, without considering user experience. A UX-centric web design project should start from scratch with wire framing – avoiding WordPress themes that fail to meet your needs is essential to website optimisation. Usability and user experience is a very broad area of web design, so instead of delving too far into it, we’re going to reference the great work of Peter Morville, who created the User Experience Honeycomb model. Covering the basics of user experience, these are the key points of the Honeycomb model. Useful – As practitioners, we can’t be content to paint within the lines drawn by managers. We must have the courage and creativity to ask whether our products and systems are useful, and to apply our knowledge of craft + medium to define innovative solutions that are more useful. Usable – Ease of use remains vital, and yet the interface-centered methods and perspectives of human-computer interaction do not address all dimensions of web design. In short, usability is necessary but not sufficient. Desirable – Our quest for efficiency must be tempered by an appreciation for the power and value of image, identity, brand, and other elements of emotional design. Findable – We must strive to design navigable web sites and locatable objects, so users can find what they need. Accessible – Just as our buildings have elevators and ramps, our web sites should be accessible to people with disabilities (more than 10% of the population). Today, it’s good business and the ethical thing to do. Eventually, it will become the law. Credible – Thanks to the Web Credibility Project, we’re beginning to understand the design elements that influence whether users trust and believe what we tell them. Valuable – Our sites must deliver value to our sponsors. For non-profits, the user experience must advance the mission. With for-profits, it must contribute to the bottom line and improve customer satisfaction. Conversion Rate Optimisation (CRO) is one of the most essential tools out there. Most websites don’t have a traffic issue, but almost all websites have a massive conversion issue. CRO takes the guesswork out of increasing conversions by giving you insights using valuable tools like heat maps, click tracking, user testing and A/B (split) and multi-variate testing. The difference between a conversion rate of 1% and 7% can be the most basic thing, like using bullet points instead of paragraph text, re-colouring buttons, or removing all links, so the only clear path is to hit the BUY NOW button. For more information on CRO, check out our blog post on landing page optimisation tips. Most people picture games or in-app mobile sites when they think of mobile apps, giving little thought to commercial use. The below stats from Our Social Times demonstrate the important role apps have the potential to play in the future of digital strategy. Gen Ys, who use their phones on average two hours per day, will make up 50% of the workforce by 2020. Correspondingly, 96% of executives cite poor communication for failed workplaces, demonstrating immense benefits for creating social business tool apps. In fact, 11% of businesses listed developing an internal mobile communication app as a priority in 2014. This establishes a great opportunity for businesses to create apps for resale or internal efficiency! Consider adding an app to your digital marketing mix! We hope you enjoyed this breakdown of digital strategy! Check out the Search Factory blog to see more digital marketing tips. To start developing a custom digital strategy for your business, contact us today.